I've always liked taking supplements. I eat fairly healthy, and I exercise a lot, but I also push myself to the limit on a daily basis with trying to juggle jobs and family. 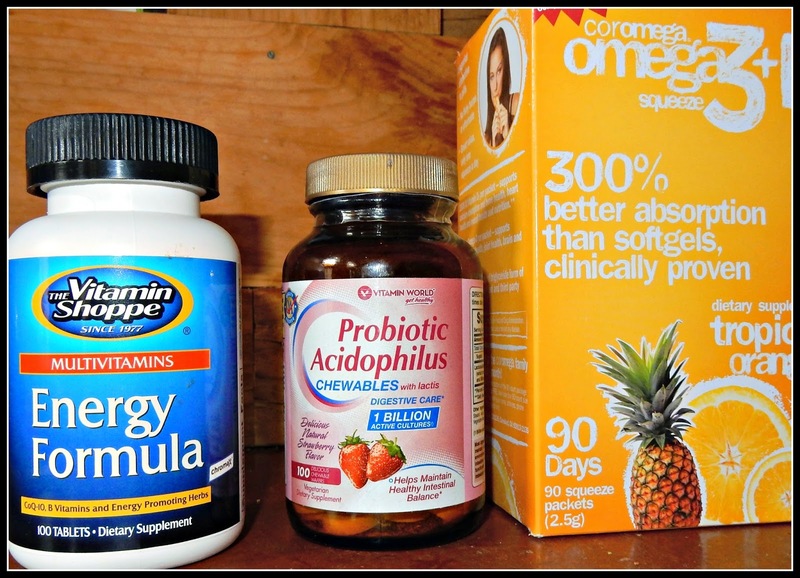 I have some supplements I've been taking for a while, and thought I'd share them. This is not a sponsored post. I just have a few products I really like and would recommend. I love the Vitamin Shoppe's Energy Formula multivitamin. I've been taking it for about 15 years! I have tried switching a few times, but always feel like I'm dragging when I do. The Energy Formula has goodies like royal jelly and ginsing in it that really seem to help me function better through the day. active cultures. The one I have been using lately has 1 billion active cultures. I've been hearing a lot lately about probiotics assisting in weight loss - which might be an added bonus if you are looking for that. I like to take Omega 3s. I have been using these Coromega 3 packs - they are easy because they are individual servings, and they taste good with no fishy taste. I like Barlean's too though. I also take calcium, extra B-12 (I have a history of deficiency, which was very difficult to get rid of, so I always take extra), and Vitamin D in the winter months. When I have joint pain, I supplement with glucosamine chondroitin, but I try not to stay on that for longer than 6-8 weeks, as it tends to raise my blood pressure. These are the things that help keep me going, day after day, run after run, rush after rush. How about you, readers? Have you found any supplements that you really love? The scientific literature on supplements is so confusing. I used to take extra C, E, B12, et. al. Vit E was good, then bad, then good, now bad! GAAA! So I treat them like the comma. When in doubt leave it out. I take an aspirin and one multi and that's it. I think I am the supplements princess! I do like soy lecithin, and I am taking Ecgc and HMB currently, to prep me for tomorrows surgery. I want to try to retain as much muscle mass as possible during the time I am healing and cannot really ride or lift. I also take Metafolin (dr orders) and turmeric (inflammation). The rest are minerals and vitamins. I used to take a lot, but my doc said I was wasting my time. I take a prenatal when I get a cold. I have to admit I am not good about taking supplements - I get lazy and forget about them. But, I do believe they are beneficial, and I like what you have chosen wisely. Thank you for sharing this information. My husband was just saying that he doesn't think his probiotics are making a difference. I'm thinking that maybe he should try the ones you are using. I take probiotics whenever I'm down with anything. I did not know that refrigerated probiotics are better than other kinds. I have talked to my specialist about them and she wants me to take Align or Florastor. Those two are especially good for diverticulitis. I also take a multi-vitamin (Centrum Silver) and Co-Q 10. Plus my doctor just started me on folic acid for some brain problems. There is a new study out on that. I also take prescription vitamin D. Your chewables are refrigerated? I would love to take that energy formula!! We used to have a Vitamin Shoppe here in town. But they closed down many years ago and I have not seen another one in my travels. I have used some of the same down through the years. I highly recommend them also. I have yet to find a good multi. I take Vit C, an aspirin, and a calcium, magnesium, zinc capsule every day. I'm trying something called Intestinal Soothe and Build right now to try and get off prevacid that I take for GERD. I just read something the other day about omegas being important, and I've been looking for a good one to try. Thanks for sharing. my mommy needs something that could help lower her cholesterol... and raise her HDL... she can't take the cholesterol pills anymore.. But she does take aspirn,, and lots of ibprofin. I take several regularly and there are a few others that I alternate. My vitamin D levels tend to run low in winter so I take that. I find magnesium is essential to keep muscle pain down. My daily supplement is probiotic and vit C. Omega 3, calcium and other mineral are included in the enriched milk that I do drink everyday. As a worker and mother that have lots of activities, I really need supplement to maintain my body health. Probiotics are so important. Thanks for sharing your picks! Do you take Turmeric? Excellent... We also take a combo pill consisting of Magnesium/Zinc/Calcium at night--which helps us both sleep better. Hi Lisa: I've always admired how you balance so many responsibilities. I also enjoyed reading other comments from your many readers. I'm still learning. A girl at the gym tonight explained how she takes almonds and places them in water for 24 hours to "sprout" and why that's good. I use CoQ10 and have been told it's very good for supporting heart health and cellular energy. I ran out of probiotics and need to go buy more. Right now I'm doing a cleanse so I won't need them till after I'm finished.